lest the Witchwood be your doom! Those who have ventured into the Witchwood (and made it back in one piece) whisper of creatures twisted by terrible curses, of dark magics practiced under a gibbous moon, and unearthly howls that chill the blood of even the most stalwart heroes. Here, have a taste of what’s in store for you in this most accursed place. Some minions are afflicted by the worgen curse and switch their attack and health at the end of your turn while they are in your hand. Once played, these minions no longer switch between human and worgen form. Deep within the woods, an evil presence stirs. A curse has fallen on the Witchwood. You must venture into the forest and root out this foul darkness once and for all. But, beware; strange howls pierce the moonlit night, and fearsome creatures prowl the gloom among the ancient trees and gnarled firs. Hold fast, and let courage see you through this night! 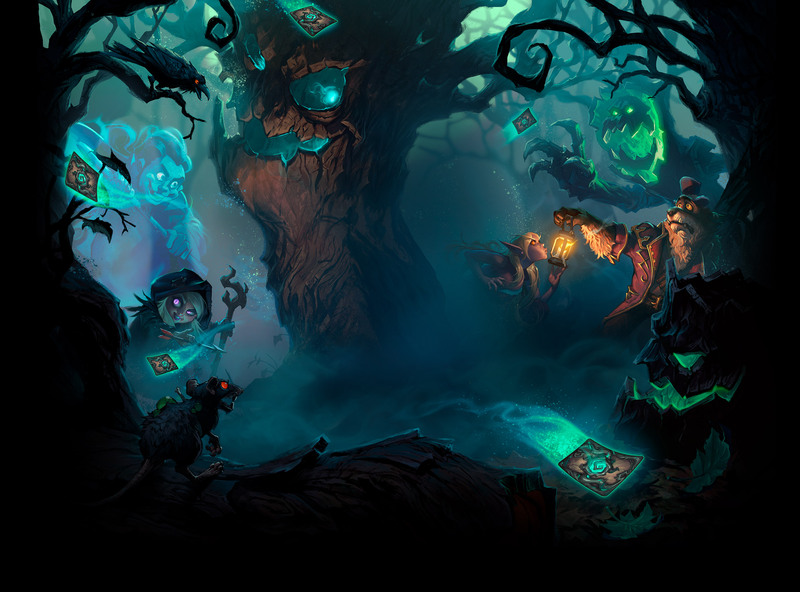 When you start a new Monster Hunt, you venture into the Witchwood as one of four unique new heroes exclusive to this game mode. Your goal is to fight through a series of eight ever more challenging encounters culminating in an epic showdown with a challenging boss fight. Each of the four new heroes has access to a special hero power and cards that create completely new playstyles and strategies. Their powers are great, but you will need all the help you can get against the Witchwood’s fiendish foes. After you beat an encounter, you choose loot to improve your Monster Hunt deck. Your choice is between three sets of three cards picked randomly from a number of different thematic buckets available to your current hero. Additionally, at certain intervals you get to add special cards to your deck that improve your unique hero power or otherwise synergize with your hero in a powerful way. And still they were brought low. And still their plan was nixed. And the Witchwood claimed them all.